We ended the 2013 season on a high note by placing 2nd out of 58 teams at this year’s Keystone Classic. Keystone is probably one of our favorite competitions that we regularly attend. The staff and organizers are wonderful and very responsive to anything anyone needs. There is always plenty of room for every team and the competition keeps growing and growing. We would not be surprised to see 70 teams at this one in 2014. The weekend started out a little shaky for us. On our way up to Harrisburg, PA, we almost had an incident just outside of Baltimore. Traffic came to an instant stop as we were cruising along and I had to get on the breaks so hard our trailer tires actually locked up and started squealing. I didn’t even look at the cars in front of us, I was watching our Green Eggs in the rear view mirror praying they wouldn’t come hurtling out of their straps, and flying into the truck. Luckily they held on and we have managed to avoid an incident with our fragile eggs over three years of competing. The amazing meatballs that never made it to the judging table. The Keystone Classic has many ancillary categories in addition to the main four KCBS categories. Overall we did eight different turn ins this weekend. It’s common for teams to not partake in the extra categories as it can be a distraction from the main event, but we enjoy cooking so much that we always like to try our hands at something new and see what the judges think of our experiments. Friday night was ground beef and bologna. 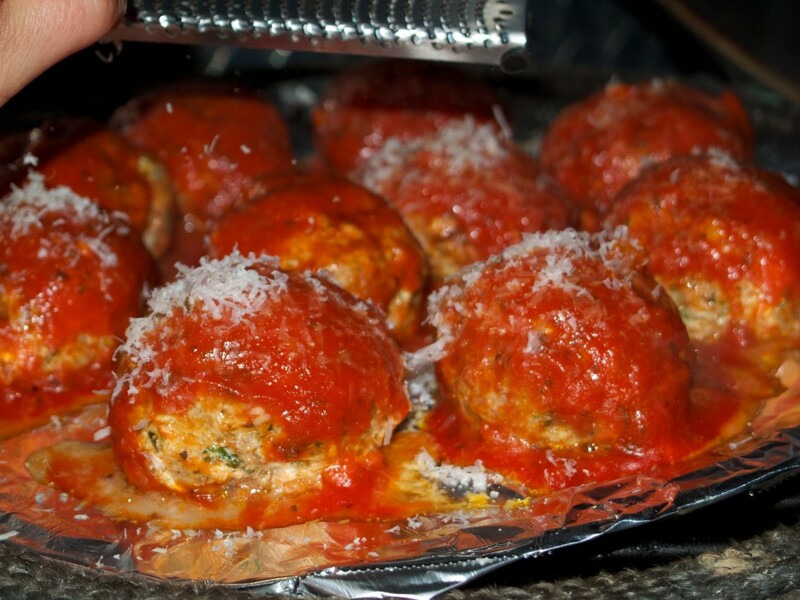 Erin created a killer meatball recipe which was served with a wonderful pasta. Unfortunately, for the first time ever, we missed our turn in window. There is always a ten minute window when everything has to arrive at the judges tent, and if you are one second late, they won’t accept it and you have to take the walk of shame back to your camp holding your completed dish. We were very frustrated because we have never missed a turn in. In this case we pushed it to the limit, and that ended up being about ten seconds too late. The neighbors enjoyed it, and we all of the sudden had plenty to eat for dinner, but we learned a lesson and luckily it wasn’t one of the important KCBS turn ins. We don’t know anything about cooking bologna; our bologna turn in was basically a cuban sandwich and we replaced the ham with smoked bologna. We liked it, the judges seemed to think there were better turn-ins than ours! On Saturday we turned in the people’s choice chicken legs and also a dessert. We didn’t win the coveted “Leg lamp” that the best legs teams receives, but we did get second place with our pumpkin spiced creme brulee. We were given three eggs and told the only rules were to use the three eggs in a dessert. 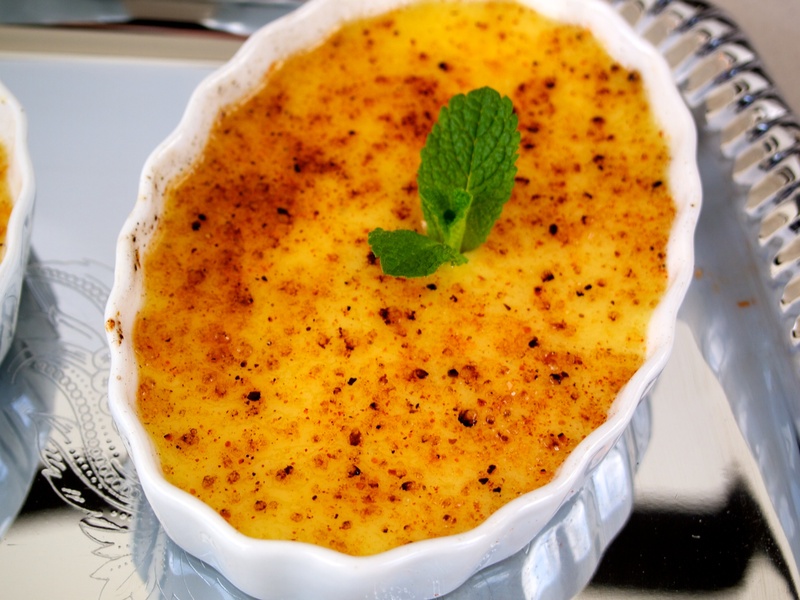 My favorite dessert is creme brulee so this was a no brainer. Luckily the judges liked it too. This was our second reserve grand champion finish, we have yet to catch the elusive grand champion, but we got within three points of it this weekend. We heard our name on the first call of the day for the official KCBS categories, 10th place in chicken. This was a surprise to us as we nearly avoided a chicken disaster this weekend. That was followed by a 3rd place call in ribs; we were hoping they’d be top ten because they cooked well. We were surprised by an 8th place call in pork. 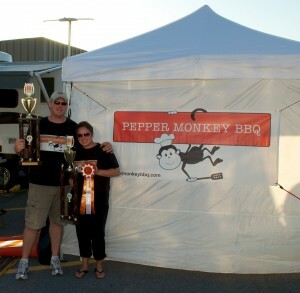 We knew our brisket was good, and were hoping for a top ten place there as well. That would mean a call in all four categories which is pretty rare for us, the only other time being our other RGC in Tracey’s Landing. Our brisket ended up being 4th place. With four top ten calls we knew we had basically hit four home runs. 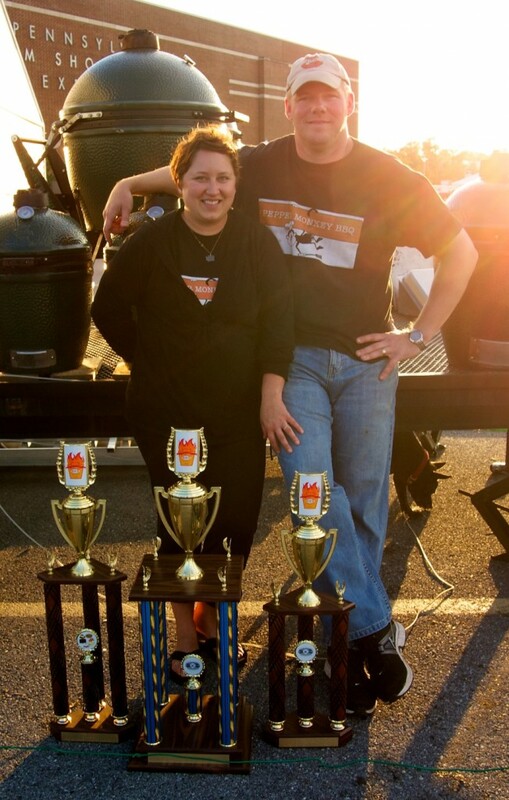 Unfortunately for us, Black Cat BBQ hit two grand slams by getting 1st place in both chicken and ribs. They edged us out by three points for the well deserved grand champion trophy. Congrats to Jen and Jack for an impressive victory! We used our new Green Egg to cook our chicken this weekend. We had practiced at home and our regular cooking technique seemed to work just fine so that’s what we went with. 45 minutes into the cook we took the temperature of the chicken and knew we were slightly behind schedule. No worries, we cranked up the heat a little and let them cook. The second time we checked, we were still behind, no worries, crank up the heat some more. The third check was getting close to the time where they had to come out, and they were safe to eat … barely, and far from the desired temp we wanted to achieve. Now there were worries, and we really cranked up the heat! We pulled them off the smoker at the very last minute and the last time I checked I was cooking them at 370 degrees, about a 100 degrees more than we normally would! We were surprised when we tried a piece and actually really liked the texture. Unfortunately by cranking up the heat, we ended up with a little more smoke coming out of the egg than we would like, and chicken is like a smoke sponge. It was more smoky than we prefer, so we were actually very happy to get a 10th place call after such a non-standard cook. I guess chicken on the new Egg will require a little more practice. The other three categories were fairly uneventful. Everything went as scheduled and we were able to take a few deep breaths and relax after our near disaster with the chicken. We had plenty of good ribs to fill the box, our pork was very juicy and flavorful, and our brisket was on point as it has been most of the season. We felt pretty good after we were done turning everything in, but had no idea if we had done well enough to get 2nd place. We had a great time as always seeing old friends and competing in our last KCBS competition of the year. We are already looking forward to next year and will be practicing much more this winter than we did last winter. We are so close to getting first place, we need to focus on perfecting every detail in order to push us over the edge. Hopefully our neighbors and co-workers won’t be too sick of eating BBQ by next spring! Superb job this weekend Joel and Erin! You should be proud of your 2012 season. If you’re like me, I suspect you feel a little frustration at just missing on that elusive first career GC this year. But when you log two RGCs and (I think) three or four 4ths overall and several more top 10 finishes in a year that is going to happen. Come back even stronger in 2013! Thanks Kit. We gained a ton of confidence this year. We now know we can compete, we just need to perfect everything. We are going to keep learning this winter and come out strong next year!